Two years after having victory ripped from his grasp, Daniel Ricciardo said he felt redemption as he took victory at Monaco on Sunday... but it didn't come easy. Nursing an engine issue for two-thirds of the 78-lap race, the Australian held off Sebastian Vettel's Ferrari to win for the second time this season, completing a sensational weekend for the Red Bull man. In 2016, he looked in just as much control, but a bodged pit-stop saw him arrive at his garage but there were no tyres to be found, and it handed victory to Lewis Hamilton. Now, two years later, the ghosts of Ricciardo's lost win have been avenged. It was a sensational performance all weekend-long for Ricciardo. Red Bull were tipped to be the class of the field long before the motorhomes and yachts arrived in the harbour but it wasn't until the end of Thursday practice that it was clear just how far the Tilbrook team were ahead of the pack. Ricciardo topped the time sheets ahead of team-mate Max Verstappen in both sessions and by a long way. 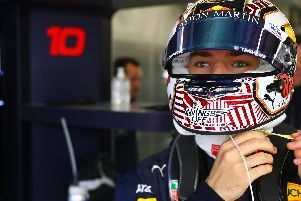 Qualifying proved to be a bittersweet affair for Red Bull though, with Ricciardo romping to pole position with the fastest lap ever seen around Monaco, while Verstappen rattled the barrier in the Swimming Pool, just as he did in 2016, to crash in FP3 meaning he'd start last. Getting away cleanly, Ricciardo appeared to have the race in hand until lap 29 when he suddenly complained of a lack of power. Losing around 20kph to Vettel behind, Ricciardo didn't put a wheel wrong all afternoon. Vettel, struggling with his tyres, simply couldn't get close to the Red Bull to make a move, but never let Ricciardo have a lap off either. Verstappen made his way safely through the field to finish ninth in the end, but the weekend will be remembered as the day Ricciardo vanquished a few ghosts. "Redemption," he said over the radio as he took the chequered flag. That it was.